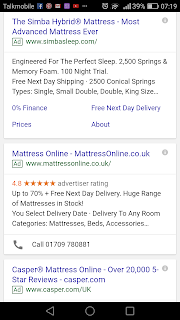 In general, I like the way that Google and other providers track what you want, and give you targeted adverts. I personally don't get people who say it's a breach of privacy, because for me, it makes my online experience better, I get better adverts, of things that I might actually be interested in. And it works for advertisers, because in turn I'm more likely to click on those adverts. If you're a reader of my blog, you may be aware that recently I was looking into new mattresses. 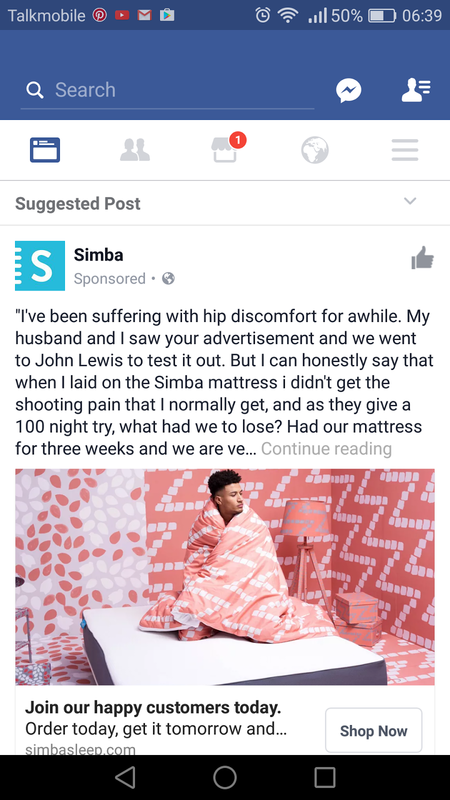 I am now being stalked by the Simba mattress. 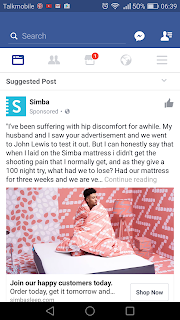 Let me start this by saying that the Simba Hybrid mattress looks damn good. It's been extensively tested, it's made up of an awesome combination of special gel, memory foam, and loads of conical pocket springs. I bet, if I tried a Simba mattress, it would be brilliant. The problem is, I already have a new mattress. 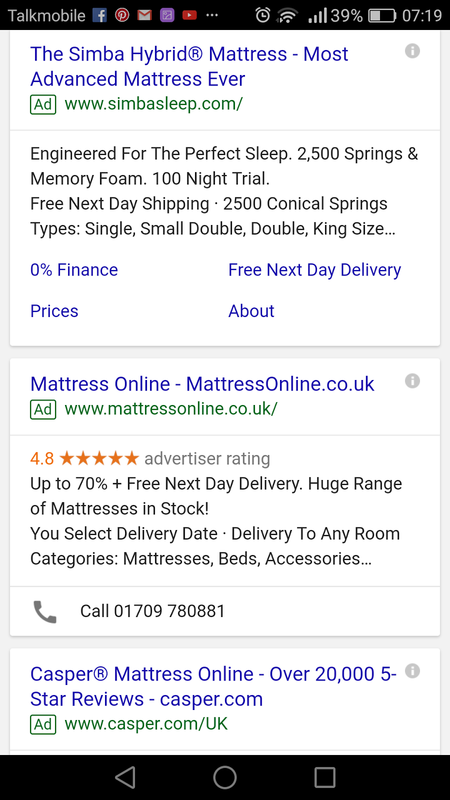 I went into a store, tried some mattresses out, and based on that went online (to mattressonline.co.uk) and ordered some mattresses. They arrived, and they are in use. So I have a new mattress. My son has a new mattress. The spare bed, admittedly, does not have a new mattress, but it's very rarely used and the mattress is in good condition, so I don't foresee it being replaced any time soon. Nevertheless, as I spend time online, what keeps slipping in the adverts? I wonder what it will be like when we move from our current computer interaction into a VR world - will I be "walking" through a virtual reality - perhaps a park, say - and occasionally a guy will step forward and say "hi there, would you like to try lying on a mattress?" Hopefully at that point you'll be able to speak directly to the guy and say "STOP SHOWING ME THIS!!" I know how you feel, Mike. If I buy something online invariably the adverts for the company will bombard me along with emails. It is a vicious cycle. Very amusing post as always. 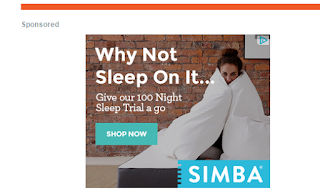 Thanks Susan :) the worst thing is by doing the research for this blog & video the Internet is even more convinced that I want a Simba mattress so I'm getting more and more adverts for them! Of course. That is how it works. My favorite annoyance is the pop up adverts. Aren't they a pleasure? I love them too but I've not really been stalked by an advertiser yet unless you count the endless bikes and pairs of Converse I can't afford. Hmm, Converse, my wife is a big fan of them, I bought some K-Swiss trainers a few weeks back because my feet were really hurting and they're pretty good, I usually buy cheapo ones from bargain shoe shops so they're a nice change. Funny! I get this, completely. I was actually on the hunt for a new mattress recently and, like you, kept getting hounded by mattress ads long after I found one. Some of them had the option to turn them off and gave you a selection of reasons why. It's funny, because they still showed up elsewhere after, but it has given me some new sites to come back to when I need another one! Bannerizer makes it easy for you to promote ClickBank products by banners, simply go to Bannerizer, and grab the banner codes for your chosen ClickBank products or use the Universal ClickBank Banner Rotator to promote all of the ClickBank products.